One shouldn’t judge a musical by its name, but ‘Eto Na! Musikal nAPO!’ is a bit of a mouthful. 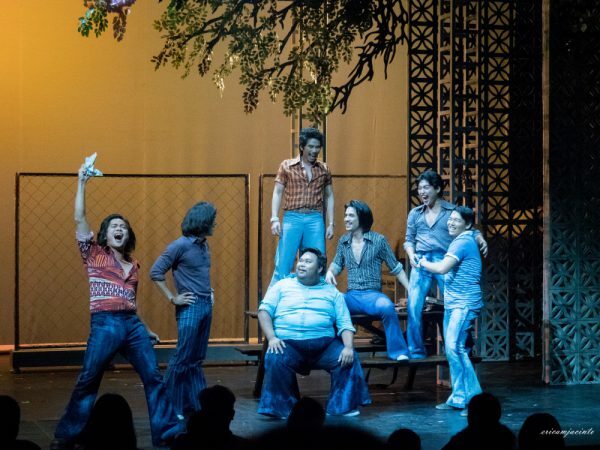 It’s not so much a title as it is an announcement that finally Apo Hiking Society is getting their theatrical turn: here it is, here’s the musical! It’s the year of the jukebox, and I suppose puns are just what we’re gonna have to contend with. If I’m going on about the title, it’s because there really isn’t much to fault in 9 Works Theatrical and Globe Live’s newest venture. What transpires on stage of the Maybank Performing Arts Theater is a delightful two hours of friendship, love, and music. 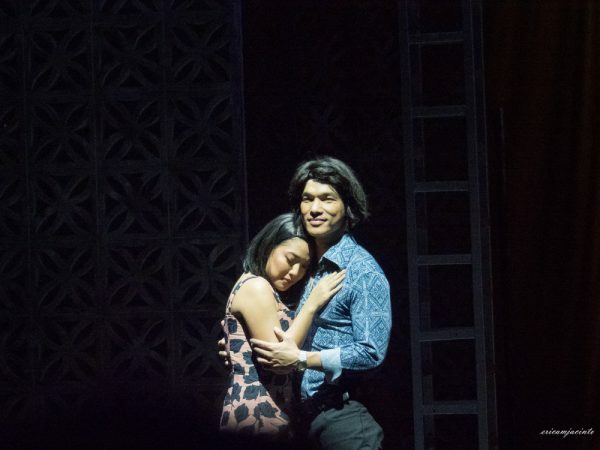 It starts with an overture of APO melodies (Daniel Bartolome is musical director and arranger) setting that 70s mood and the set bathed in lighting (Shakira Villa-Symes is Lighting Designer). And then it’s interesting hairstyles and bell-bottomed jeans donned by the cast. The decade is just as much a character in this show, with dialogue (director Robbie Guevara is also the writer, with Jonjon Martin as dramaturg) peppered with lingo and referential asides to the cultural landscape back then. This attention to detail elevates the show, and adds a layer of joy to audiences looking for a stroll down memory lane, or younger viewers who don’t have a personal connection with the era. It’s the dawn of a new semester. Martial Law is also 3 years in, but the story told is about privileged college co-eds with the luxury of treating political turmoil as more of a nuisance than a devastation. A slew of boys being boys are at the center of the plot; there’s a song-writing competition they want to join, but they’re primarly preoccupied with chasing after girls. Rick (Mark Bautista) is a neglectful boyfriend, Sonny’s (Alfritz Blanche) girlfriend is leaving for the States, Butch (Jobim Javier) is in love with someone else’s girl, and Ray (Jon Philippe Go) is crumbling under parental pressure. As for Jamie (Jef Flores), Donnie (Jon Abella), and Bobby (Vyen Villanueva), they’re just happy to be there. The simple premise dawdles into Ray’s turbulent home life and the love lives of the other guys, but there’s a deliberateness to it. There’s a matter that Guevara doesn’t want to call into attention too early or else it would ruin the surprise. But there’s a lot of joyfulness to the characters’ relatively low-stakes tribulations before that point that gives way to lively song and dance by the ensemble (PJ Rebuillida is choreographer) in numbers like “Blue Jeans” and “Heto Na”. Bautista and Rita Daniela (playing his girlfriend, Anna) lend their beautiful voices to a romantic rendition of “Nakapagtataka”. Marika Sasaki (playing Blanche’s girlfriend, Jane) offers up a whole lot of charm, as do Sab Jose (as Javier’s love interest, Michelle). Javier, in his first foray into theater, recalls the carefree demeanor of young lads in funny movies from that era. 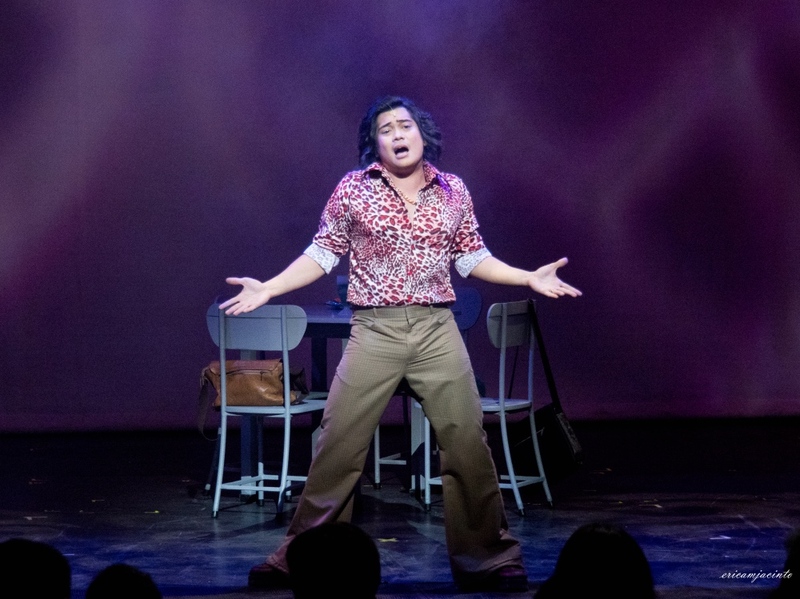 It was a riotous performance, and by the time he’s done singing that surprising take on ‘Panalangin’, he’ll have had you in stitches. It can’t all be fun and games, though, with Go’s home life dampening the festivities every few scenes. Initially, his strict father is keeping him from playing music and his mother’s illness stripping him away of his youth. His situation escalates to Martial Law victim seemingly out of nowhere. Someone needs to be suffering the regime’s effects in narratively impactful ways, and who better to put up for slaughter than the character already having a hard go of it. The Ray subplot did lend itself to a lovely-albeit-sad “Batang-Bata Ka Pa” (performed by Neomi Gonzales, Ray’s mom) and the truly gut-wrenching version of “Pag-ibig” (led by Raul Montesa as Ray’s dad), with Guevara showcasing a knack for staging high emotion. Side conflicts slowly chip away at the initial 7 lads, but all’s well that ends well and those that remain are at the competition. Guevara doesn’t deliver that momentuous competition number, but serves up an even more satisfying ending: everything that had just transpired, was actually an origin story. In the endless possibilities of stories to tell using the trio’s timeless repertoire, Guevara chose to tell a version of the group’s very own, set in the time they’re singing about and telling a tale that wouldn’t have been different to experiences that inspired the songs. ‘Eto Na! Musikal nAPO!’ never purports a story or experience or point of view that was too far away from the ethos of the group and the end result? A definitive homage to Apo Hiking Society.